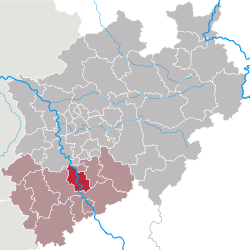 For ither uises, see Cologne (disambiguation). Cologne (German: Köln, pronounced [kœln] ( listen); Kölsch dialect: Kölle [ˈkœɫə]) is Germany's fowert-lairgest ceety (efter Berlin, Hamburg an Munich), an is the lairgest ceety baith in the German Federal State o North Rhine-Westphalie an athin the Rhine-Ruhr Metropolitan Aurie, ane o the major European metropolitan auries wi mair than ane million inhabitants. It is ane o the auldest ceeties in Germany, haein been foondit bi the Ubii in the year 38 BC. The name is derived frae that o the Roman dounset, Colonia Claudia Ara Agrippinensium. Cologne lies on the River Rhine. The ceety's famous Cologne Cathedral (Kölner Dom) is the seat o the Catholic Archbishop o Cologne. The University o Cologne (Universität zu Köln) is ane o Europe's auldest varsities. Cologne is a major cultural centre o the Rhineland an haes a vibrant airts scene. Cologne is hame tae mair than 30 museums an hunders o galleries. Exhibitions range frae local auncient Roman archeological sites tae contemporary graphics an sculpture. The Cologne Trade Fair hosts a nummer o trade shows such as Airt Cologne, imm Cologne Internaitional Furniture Fair an the Photokina. Cologne is an aa well-kent for its celebration o Cologne Carnival, the annual reggae summerjam, an Cologne Gay Pride. Athin Germany, Cologne is kent as an important media center. Several radio an television stations, includin Westdeutscher Rundfunk (WDR), RTL an VOX, hae thair heidquarters in the ceety. Baith Pro7 an Sat.1 produce TV shows in Cologne as well. Further, the ceety hosts the Cologne Comedy Festival, which is considered tae be the lairgest comedy festival in mainland Europe. ↑ "Amtliche Bevölkerungszahlen". Landesbetrieb Information und Technik NRW (in German). 18 July 2016. ↑ "Cologne Comedy Festival website". Koeln-comedy.de. 2007-10-21. Retrieved 2009-07-24. ↑ "Kyoto City Web / Data Box / Sister Cities". www.city.kyoto.jp. Retrieved 2010-01-14. ↑ "Sister Cities". Beijing Municipal Government. Retrieved 2008-09-23. ↑ "Twinning Cities". City of Thessaloniki. Retrieved 2009-07-07. Wikimedia Commons haes media relatit tae Cologne. 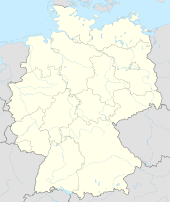 This Germany-relatit airticle is a stub. Ye can help Wikipaedia bi expandin it. This page wis last eeditit on 4 Mairch 2018, at 21:09.